After adding a product to cart there is a possibility to show a pop-up screen with basket details, recommended products or other information. 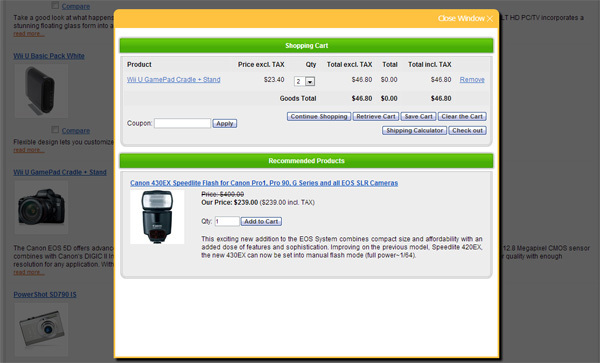 The new pop-up page is triggered on Add to Cart action and can be configured in CMS. Select Show pop-up frame for 'After Adding Product' action in Settings > Products > Products Settings. Configure the page Add to Cart Frame in CMS > CMS > Pages Layouts. By default there is selected Shopping Cart block but it is possible to use 'Shopping Cart: Recommended Products' and any text blocks.